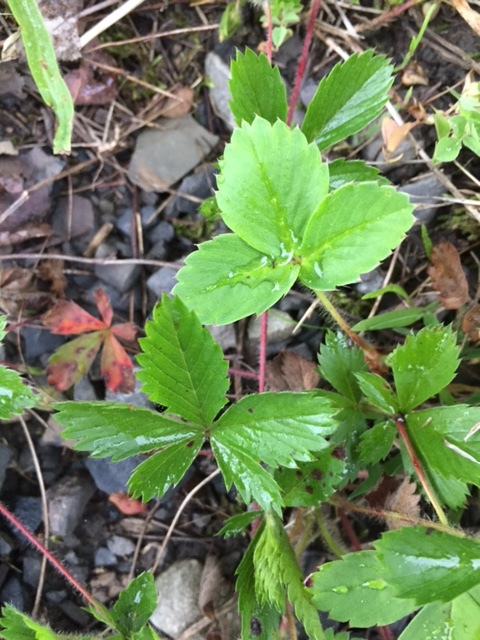 The delicious and delightful wild strawberry just came into season here in Western PA, and I thought I’d share a bit about how to find this plant and why it is worth seeking out both as a wild food and a wild medicine. 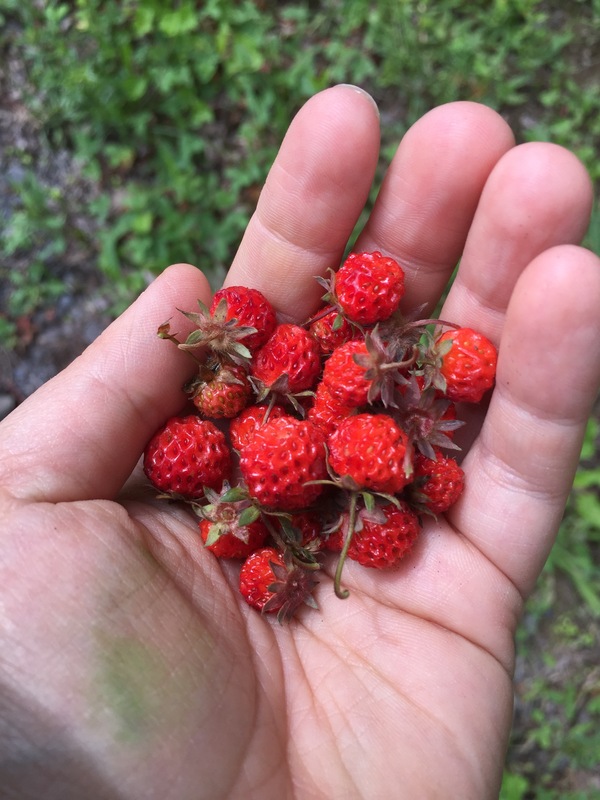 Wild strawberry is incredibly flavorful and delicious, and in my opinion, is a really high quality wild edible that is worth seeking out (which, thankfully, isn’t that difficult). Strawberry leaves also serve a medicinal purpose as a gentle astringent. This post will detail where wild strawberry typically grows, its overall growth habit, two look-alikes that should be avoided, and some information on how to harvest and enjoy wild strawberry. The wild strawberry is also known as the woodland strawberry, alpine strawberry (although there are other cultivars also known as alpines that are clumping, fragaria vesca is a running variety), or european strawberry. It is abundant and diverse and grows in many temperate places in the US and beyond. It is a great beginner wild food and wild medicine! At the right time of year, you can spot the little white wild strawberry flowers underneath or alongside the wild strawberry leaves. They are in the rosacacea family, and so, have five white petals with five bracts (little leaves in between the petals) and a number of small pollen pods that are yellow surrounding a yellow stamen. About a month later (in my region, at least) you can find the delicious red fruits. Wild strawberry prefers to grow in full sun and is found in open fields or along edges of fields and brush/forests. This is where you will find it fruiting. I have found it a lot in fields that were once farms and with low soil fertility, also on the edges of roadways, etc. It seems to have no problem with poor or rocky soil or soils that are partially bare and hot. But I’ve also found it along lush edge spaces–interestingly enough, the poor soils seem to produce smaller, but more flavor rich fruit. Like other wild berries, if there is little rain, fruits will be more potent and delicious than if there was a lot of rain before ripening (like this year). Wild strawberry grows other places as well, like inside forests with a bit of light, but often these plants do not have enough light to fruit. Strawberry is a plant that travels as it grows–strawberries slowly creep from one area to another. A single strawberry patch will expand eventually into a ring, and then break off in different directions; the older plants send out new runners and slowly expand as they go (which is an awesome thing to see)! I saw this firsthand at my homestead in Michigan-what started as a sizable single patch, later turned into a ring and into diverse new patches; the original patch was taken over by ground ivy and cinquefoil, primarily. 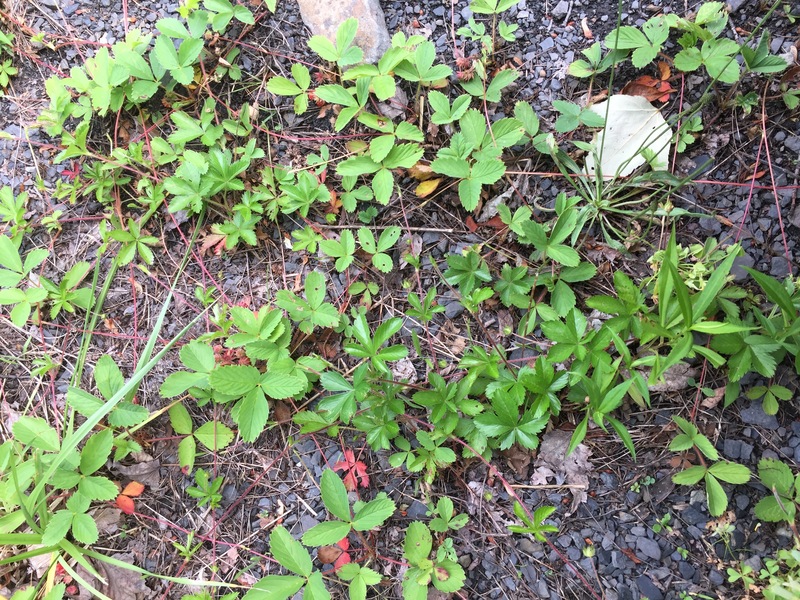 Wild strawberries are very easy to find, but so are their look alikes (and sometimes, they are all growing in the same area). There are two plants that look like wild strawberry, false strawberry (Duchesnea indica) and Cinquefoil / Polentilla spp. I’m going to cover each so you know what the differences are. Creeping Cinquefoil (typically, Potentilla Reptans) is found in the same places as wild strawberry, often growing alongside it. Cinquefoil has five leaves and yellow flowers that look similar to strawberry flowers. Cinquefoil never gets a berry, however, so its pretty easy to avoid. In the photo below, There are some cinquefoils right in the middle of this strawberry patch (there’s also some small goldenrod shoots on the right next to the Cinquefoil). Here’s a closeup of the Cinquefoil leaf (bottom) and a strawberry leaf (top). The strawberry leaf has three leaves (trifoliate) while the Cinquefoil has five radiating leaves (palmately compound). Cinquefoil itself is medicinal, its roots are moderately antimicrobial when put in contact with infected tissue (so you can make a salve or wash with them). But they aren’t tasty like strawberries! 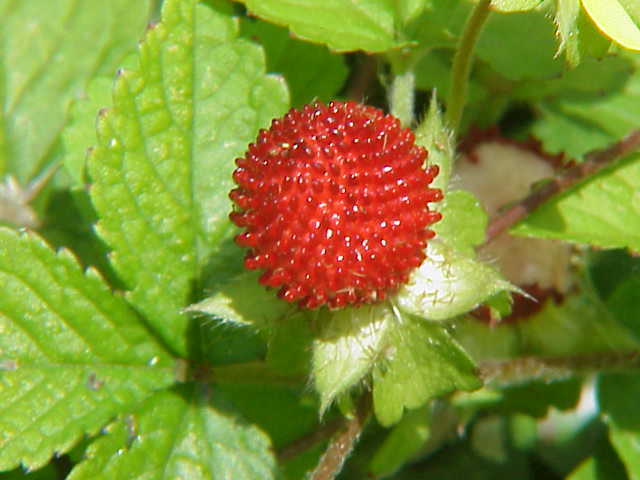 The second look alike is known as “false strawberry”, “mock strawberry” or “indian strawberry.” It produces berry that looks a lot like strawberry, and it has leaves similar to a strawberry, but the berry is flavorless. You can eat it, but who would want to? It tastes like nothing. The berry also has seeds on the outside (not indented like the wild strawberry) and many seeds in a very orderly fashion (see below). It has a yellow flower (so if you can ID the flowers earlier in the year, you will know it is a false strawberry vs. the white flower of the wild strawberry). A simple rule of thumb is to not eat anything with yellow flowers, and stick only to the white flowers. Its been a while since I’ve seen one of these; they aren’t nearly as abundant around where I live as the Cinquefoil (which is as abundant as strawberry herself). The false strawberries grow up, pointing towards the sky while the wild strawberries are usually hanging or growing on the ground. 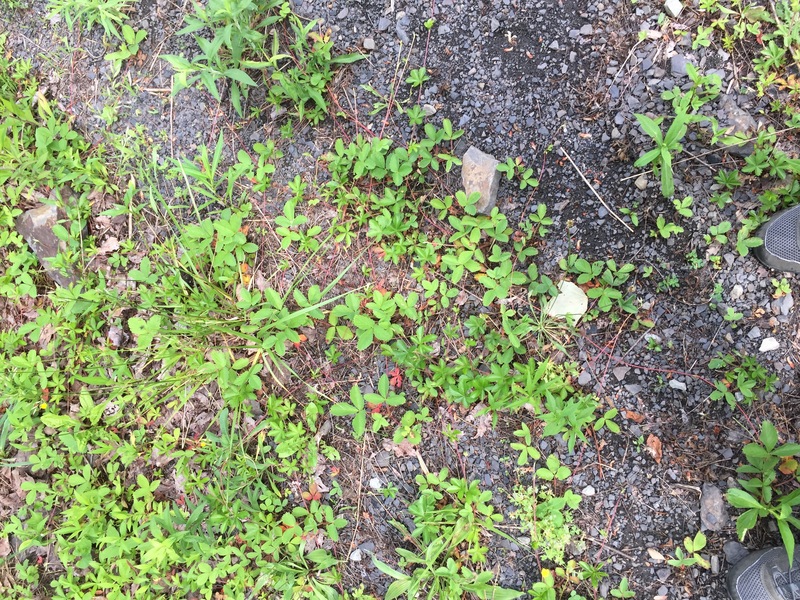 When doing any wild food foraging, you should make sure that you are harvesting in a safe environment, free of toxins and not too close to houses with lead paint, roads, and so forth (see my earlier post on foraging part 1 and part 2). There are a few tricks to harvesting wild strawberries. Like garden strawberry varities, dense foilage can often cover the tasty berries. You can use your hand to gently move away the leaves to get at the berries. You’ll also want to work your way carefully through the patch, trying not to step on any as you work through. Although they are small, they are often abundant, and if you gather for even 10 -15 minutes, you’ll have several handfuls for fresh eating. Remember that there might be a ring, or a line, or several patches in the area–so look carefully! Strawberries ripen over a period of a week or so, so you can come back every day or so for more fresh strawberries. 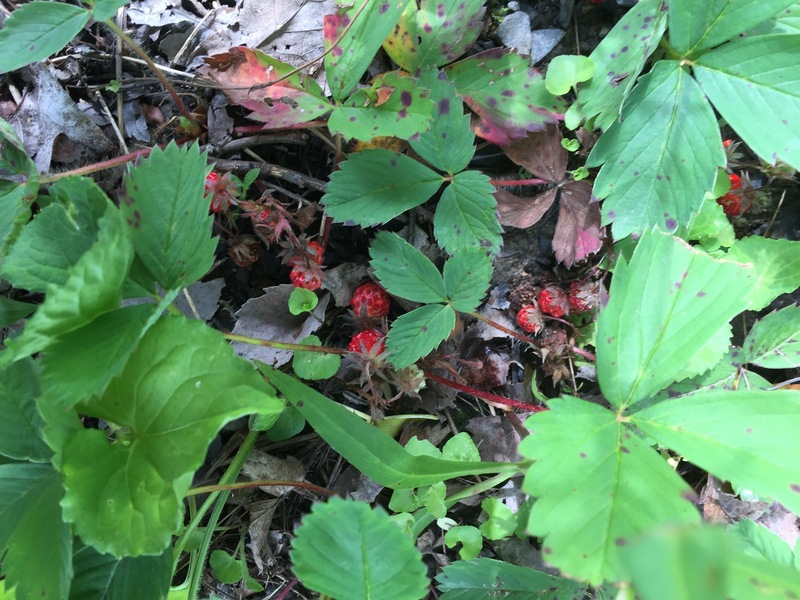 Wild strawberries on the ground, brush leaves aside to see even more. Since wild strawberry is so small, I typically just eat them fresh. If you had them in extreme abundance, they’d certainly make a nice jam. I once combined about 2 cups of fresh wild strawberries with some I had grown that were much larger for a jam–that was great. If you had them in a lot of abundance, you can also dry them and enjoy anytime or make a fruit leather (see my instructions here). Finally, a note about balance. I think that it is important to give something in return to the plant itself if you are harvesting fruit or leaves. This can take a number of forms: a bit of organically grown tobacco is a welcome gift to many plant spirits. If you are willing to scatter some of the strawberries themselves (with their seeds) the strawberries will be very happy. You might find other things to do as well, but these are two I have found are very effective. Strawberry leaf is packed full of vitamin C and can be enjoyed as a tea either fresh or dried. The tea has a mild and slightly fruity flavor (and some substitue it for green tea when a person can’t have caffiene). I like to harvest leaves (maybe one per plant) when they are first blossoming. They get a bit stronger after the fruit come in (still fine to harvest for medicine). A lot of folks will use these gentle leaves as a nourinshing tea that is tonic on the body and soothes the digestive system, particularly for those who suffer from diarrhea or loose stools and/or could use immune system support (provided by Vitamin C). Strawberry leaf is also a gentle astringent (with a high tannin content). I like to use it as part of an eye wash for conjunctivitis/pink eye when the eyes are goopy and watery (in conjunction with plantain for healing). It is also great for a daily rinse for the gums and teeth. Herbalists have used this successfully in tooth powder recipes to help treat plagque and bleeding gums (typically with clay, baking soda, and so on). You can also brew up a strong cup of strawberry leaf tea and use it as a treatment for sunburn, simply lathe the affected areas with a soft cloth or cotton ball. If you combine this with calendula or plantain, it is even more effective. I love the gentle spirit of the wild strawberry. She is giving, soothing, abundant, and magical! I hope that you will enjoy some of the benefits of this amazing and easy to find plant!